Tthis flavor-packed pasta that comes together quickly from pantry ingredients. 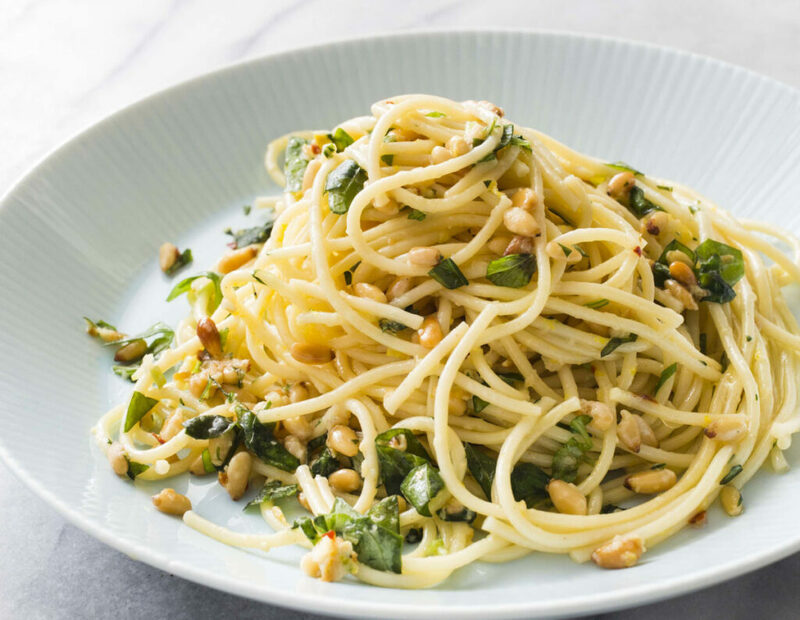 n Garlicky Spaghetti with Capers and Currants: Omit lemon zest, basil, and pine nuts. Reduce lemon juice to 1 tablespoon. Stir 3 tablespoons capers, rinsed and minced; 3 tablespoons currants, minced; and 2 anchovy fillets, rinsed, patted dry, and minced, into pasta with lemon juice. n Garlicky Spaghetti with Green Olives and Almonds: Omit lemon zest and reduce lemon juice to 1 tablespoon. Stir 1 cup green olives, chopped fine, into pasta with lemon juice. Substitute Pecorino Romano for Parmesan and toasted sliced almonds for pine nuts. n Garlicky Spaghetti with Clams: Omit lemon zest and pine nuts. Reduce lemon juice to 2 teaspoons. Stir 2 (61/2-ounce) cans whole clams, drained and chopped, and 4 anchovy fillets, rinsed, patted dry, and minced, into pasta with lemon juice. Increase Parmesan to 3/4 cup and substitute 2 tablespoons chopped fresh parsley for basil.